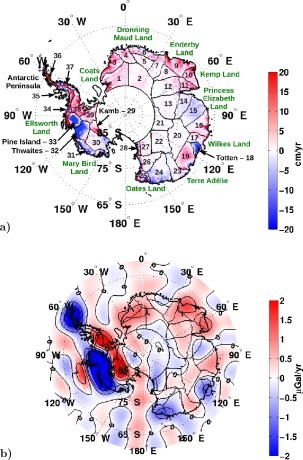 A paper published today in Earth & Planetary Science Letters evaluates snow and ice-mass changes in Antarctica using both satellite altimetry [Envisat] and gravimetry [GRACE] between 2003-2010. The data shows most areas of the ice sheet are stable to increasing in ice mass, including the East Antarctic ice sheet, which alone contains over 80% of the total ice mass of Antarctica. The Pine Island and Thwaites glaciers in West Antarctica, which overlie geothermal heat sources are found to be losing ice, but represent relatively small regions of the ice sheet. The entire Dronning Maud Land north coast of Antarctica was found to have increasing snow accumulation. The changes shown appear to be highly regional and/or related to known geothermal sources, rather than more uniform changes as would be expected from global warming. Antarctic sea ice extent has recently hit record highs, but that too is being [falsely] blamed upon global warming. Climate models falsely claimed Antarctic sea ice would decrease, and that Antarctic sea ice would decrease more than Arctic sea ice. Top graph is satellite altimetry, bottom is gravimetry [measurement of gravity] from GRACE. Red areas are increasing ice mass, blue areas losing ice mass, white areas no change. We combine GRACE and Envisat data to examine snow and ice-mass changes in Antarctica. We account for leakage effects in surface-mass rates estimated using GRACE solutions. We estimate regional change in air and ice content of the Antarctic Ice Sheet surface. Estimated snow accumulation rates agree well with predicted surface-mass balance rates. Overall land ice mass is in decline.